On the upper leaf surface, reddish and brownish “measles”-like spots develop earlier in summer, now coalescing into purple blotches. I noticed this week a different symptom on the lower leaf surfaces, described quite aptly by Nancy Pataky of the University of Illinois as “dull chestnut brown” in color. Cladosporium blotch truly starts to look unsightly now and this worsens as the growing season wanes. The fungus overwinters on dead stems and foliage, which is a real hint for control. 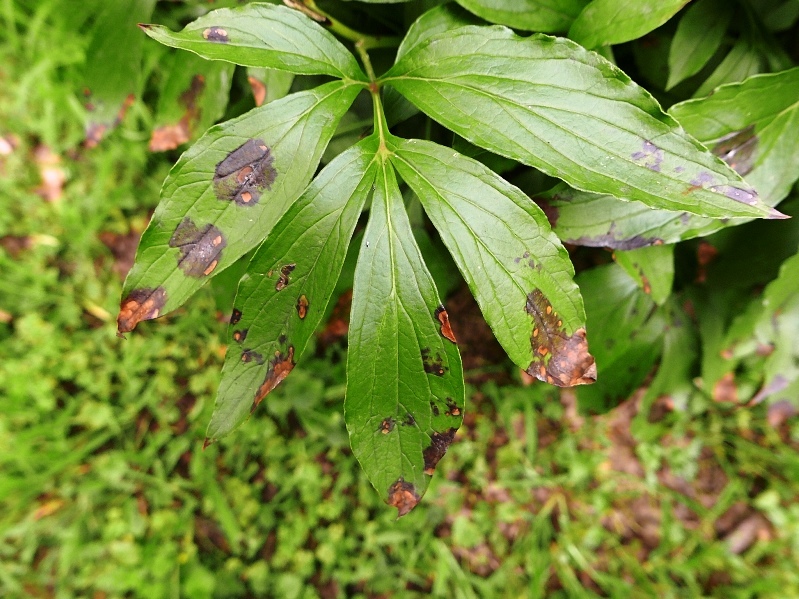 Sanitation, which OSU Extension Educator Tom De Haas constantly reminds us is a crucial key to plant disease management – certainly is the key for Cladosporium blotch control. Horticulturist, purge, not thyself, but peony debris – in fall or early next spring. The good news is that peony measles is not a serious health problem for this lovely plant. So – sanitize. Or if you cannot bear to ever look at measles again, get more modern peony varieties or start a preventive fungicide program next spring.